Please see the January Newsletter for details of items for sale. From April 2014 the Taxicard scheme will no longer be in existence and no claims for refunds will be honoured after that date. The decision to cancel Taxicard is due to grant funding we receive for the scheme being withdrawn and subsequently as a small charity we can no longer afford to run it. We apologise for this bad news but in the current climate we have been very lucky to keep the scheme going for as long as we have. 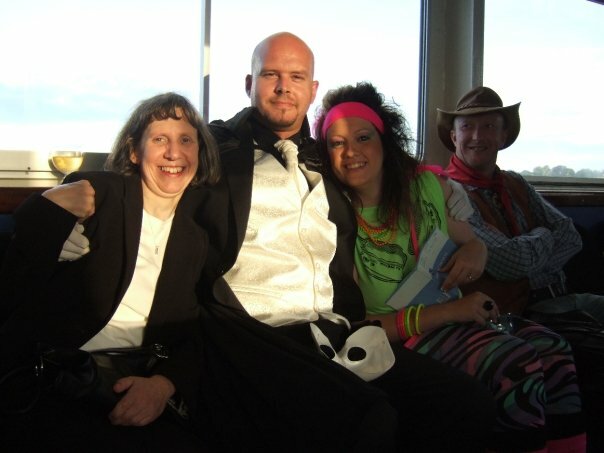 This year ExeAccess' annual Fancy Dress Boat Cruise was a fabulous fundraising event. It was a fine evening and the boat went along the coast, past Dawlish Warren, Dawlish, along Teignmouth Sea Front and into the Harbour, much to the delight of all the locals on the Back Beach who were dancing to the Music from the Bailjumpers as well as the revellers in the boat! The costumes this year were exceptional and this years winner was Princess Leia from Star Wars. This event sold out and will be run again next year on the 5th July. ECTA will be changing its trading name to ExeAccess on Monday 8th April 2013. This will coincide with the launch of the 4 Rs project. Nothing will change - we will still remain as Exeter Community Transport Association (ECTA) but for day to day purposes we will be known as ExeAccess from that date onward. Why the Change? ECTA is all about Access for people with disabilities and mobility problems: it makes sense on many fronts to have a name that reflects the services our charity offers. The name change will reflect well in our yearly quest for the funding which we desperately need to function and subsequently will strike a chord with those charitable trusts to which we write asking for grants. The purpose of this project it to Recover unwanted, abandoned and unused mobility equipment. Please see the February newsletter for details. If you're coming to stay in Exeter or if you are going away somewhere, long term hire is available for manual wheelchairs and collapsible scooters. It costs £6 per day to hire a manual wheelchair and £10 per day for a boot scooter. OUR RING & RIDE MINIBUS SERVICE IS AVAILABLE FOR HIRE BY ANYONE WITH A PHYSICAL DISABILITY, MOBILITY PROBLEM OR VISUAL IMPAIRMENT. Please view the November newsletter for our Christmas Opening times. Notice is hereby given that the Annual General Meeting of Exeter Community Transport Association will be held at our offices at 8-10 Paris Street, Exeter on Tuesday 11th September 2012 at 18:00. Please see the July 2012 newsletter for the agenda. An exciting programme of Summer Excursions will be available soon!! 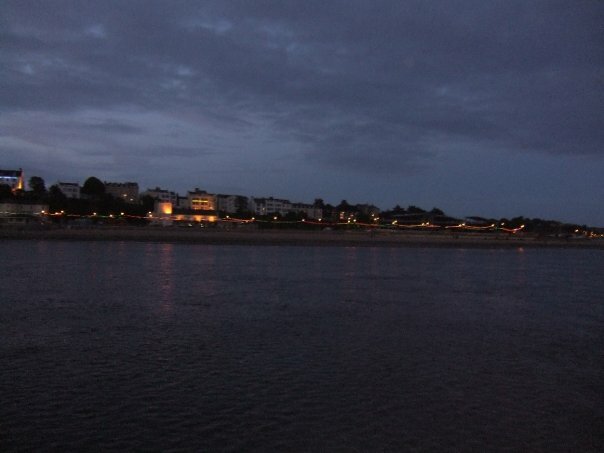 An evening cruise on the River Exe, with On board BBQ, licensed bar and a great atmosphere. After a successful launch on Monday 9th January attended by Project users, Funders and Councillors. Service User Chris Norton took the Tramper out for its maiden voyage! The Trustee's, Management, Staff and volunteers of ECTA would like to wish all our Service users a very Merry Christmas and Happy New Year and thank everybody for their support over the last twelve months and hope to see you all next year. This year's Gig in the Garden raised £603.90!! Thursday 15th December, E.C.T.A Trustees will be out and about during late-night shopping in Exeter talking about the charity and what we do. E.C.T.A will be open till 9pm on this night to help our service users enjoy the experience of late-night shopping. We have successfully obtained funding for our new venture The Greater Exeter Access Project. More details in the November 2011 newsletter. Through grant funding we have been able to purchase a Powerchair and two scooters to update the fleet. This year's cruise was again another success over 90 tickets sold at £10.00 a head. The cruise as usual had a fancy dress theme. This year being 'cartoon characters' and everywhere you looked there were Mr Men, Popeye's, Olive Oils, characters from the nightmare before Christmas and even Penelope Pitstop. This years band was the fabulous Bailjumpers who put a great show on, free of charge and really rocked the boat! Plus many other prizes of £50!! Ticket price £1.00 Each. Available from the ECTA office. Please support this worthwhile cause. This year's Gig in the Garden was held on Saturday 3rd September 2011 (12 noon until 12 midnight) at Woodleigh Coach House with the following groups confirmed. Our latest community resource for booking trips or holidays is now available from our office in Paris Street to enable you to book trips and holidays. For more information, visit the Transport Hub section on this site. £3000 - Sobell Foundation, £1500 - DCC Exeter Councillors, £1500 - The Moxon Trust, £1000 - Boshier Hinton Found, £1000 - Albert Hunt Foundation, £500 - The Pennon Group, £500 - Normans Family Trust, £500 - NHS Primary Trust, £500 - Good Neighbours Trust, £300 - Viscount Amorys. Join us on Saturday 9th July 2011 for a summer boat cruise on the Exe. We have a BBQ, bar and a band. We would like to welcome from the end of January four students from Plymouth University who will be working on the above project as part of their social work degree. The Transport HUB will be a service that will enable people with mobility needs to book journeys to and from their destinations on accessible Transport. Live Access to Trains, Buses, Taxi companies and Flight providers, with assistance to help make the process easier. The HUB will become a valuable resource for disabled people in Exeter. The Launch Date for the Transport hub will be Friday the 6th May 2011. As from 1st March 2011 the price for vehicle hire is changing. Daily vehicle hire will be £4.75 per day. Holiday Long Let will be £6 per day for manual wheelchairs and £10 per day for the collapsible boot scooters. The reason for the increase is that ECTA%uFFFDs future funding is uncertain and it is becoming increasingly difficult in the current economic climate to raise sufficient money for our services. We will Endeavour to keep our costs down. On Thursday 21st April 2011, the Ring & Ride Lunch club will meet at the Tally Ho Inn, Countesswear. Please phone or call in for more details. From the 4th April, the Ring & Ride price will be increasing by 20p per journey. In our mobility centre we have leaflets on the all terrain Tramper on behalf of the countryside mobility project for Living Options Devon. The Tramper is an electric go anywhere buggy designed specifically to cover rough ground, mud and grass safely. 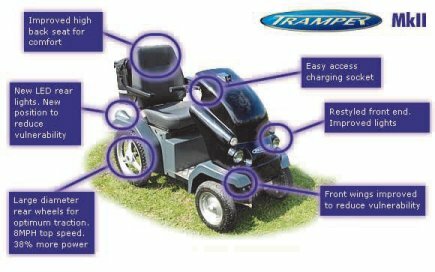 The Trampers are available for hire through the Countryside Mobility project. Berry Head National Nature Reserve Gillard Road TQ5 9AP,Brixham, Devon, 01803 882619. Haldon Forest Park,Kennford,EX6 7XR, Exeter, Devon, 01392 834233. Stover Country Park, Stover, TQ12 6QG, Newton Abbot, 01626 835236. 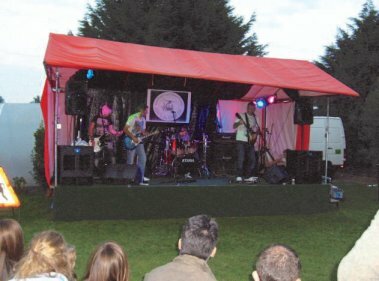 The Gig in the Garden was held at Woodleigh Coach House on Saturday 4th of September and was thoroughly enjoyed by a large crowd of people, of different age groups, all entertained by a variety of brilliant groups who played blues, soul, pop, rock, and reggae something for everyone. This event raised £1031 for ECTA and 2011's event will be even bigger. This year's Gig in the Garden will be held on Saturday 3rd September 2011 at the same venue with the following groups already confirmed. Ring the office or talk to Tony. Click here to view the poster. On the 26th February at Westpoint we'll be going to see Holiday on Ice. Tickets are £29 including transport and entrance. Phone the office to book. We have planned an outing to the Pantomime Snow White on Saturday 18th December 1pm Matinee Performance at the Corn Exchange Exeter starring Sandra Dickinson. Access is good for people with mobility difficulty. Ticket costs £17 and are selling fast, this includes the admission to the Pantomime and transport to and from the show. Successful applications this quarter, DCF £7,000, St Edmund and St Mary Major Charity £1,000, Doctor and Mrs Darlington Trust £1,000 and £50 from the St David's Players. Gig In The Garden is an annual one day music festival taking place on Saturday 4th Sept 2010 at the Woodleigh Coach House in Cheriton Bishop. There will be all sorts going on with live music provided from 8 bands, activities such as sumo wrestling and a bouncy castle, as well as good food and real ales. Profits will be split between ECTA and Devon Air Ambulance. ECTA's annual boat cruise took place on the evening of Saturday 3rd July and what an evening it was. The weather was so nice that we were able to sail along the coast to Teignmouth and back taking in the beautiful scenery and sunset. 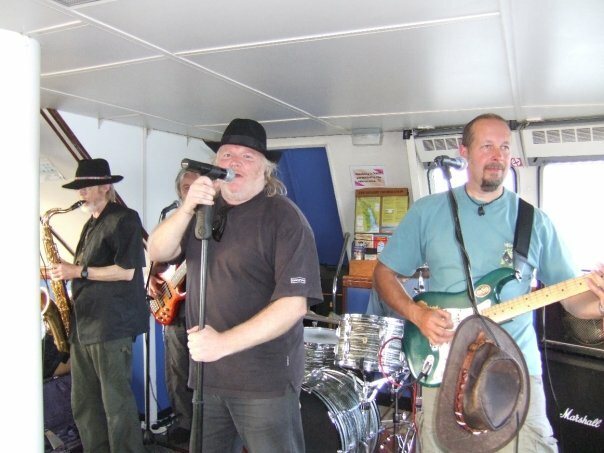 El Cojones, a rock, soul and blues band provided music to dance to (and boy we did) alongside the on board bar-b-que, licensed bar and great atmosphere. For the second year running there was an unofficial fancy dress theme, with lots of St Trinians present and quite a few costumes to turn heads! As well as it being a fantastic night, £618.00 was raised to help support ECTA's services. Thanks to everyone who came along, and next years will be taking place on Saturday 4th July. Pencil it in your diaries! In June 2010, ECTA were delighted to accept an award for Outstanding People Development at the Devon County Council Community Transport Awards. The award is a testament to the charity's commitment to supporting and developing volunteers and recognises the success of our popular NVQ programme. Arran Wilkins, one of ECTA's volunteers was also honoured with an award for his outstanding contribution to Community Transport. Well done Arran! It is with great sadness that we have to annouce that Blondell Lilley, ECTA's Vice-Chair and long standing volunteer, has passed away peacefully in her sleep. Blondie was well known and loved not just by ECTA's staff, volunteers and service users but also by the community as a whole. She tirelessly campaigned for disabled people over a number of years and had been involved with ECTA since its earliest days. Her passing is a huge loss which will be felt by many. It's that time of year again that we climb aboard the Pride of Exmouth and sail down the Exe Estuary to the sound of live music. We'll be meeting on 3rd July down Exmouth Quay from 7pm for a 7:30pm departure time. El Cojones, a rock, soul and blues band will be providing this years entertainment, alongside the on board bar-b-que, licensed bar and great atmosphere. Tickets can be purchased through the ECTA offices, or online by clicking here. All money raised from the cruise will go towards helping ECTA to provide our services. As of 1st May 2010, Shopmobility opening hours will change to Monday to Friday, 10am to 4pm and Saturday 10:30am to 3:30pm. With 2009 behind us we've spent some time reflecting on our services and the changes and developments that have taken place during the year. All this, as well as a glimpse of what's coming up in 2010 can be found in our 'End of year round up' report, which you can download from the newsletters section of the news page. Gig In The Garden is a one day music festival taking place on Sunday 6th September at the Woodleigh Coach House in Cheriton Bishop. There will be all sorts going on with live music provided from 10 bands, activities such as sumo wrestling and kangaroo boxing, as well as good food and real ales. Profits will be split between ECTA and Devon Air Ambulance. On Friday 3rd and Saturday 4th July you may have seen us down at Sainsburys in Pinhoe. We were there throughout both days collecting in order to support our services for Exeter people with mobility issues. ECTA would like to send our whole hearted thanks to anybody who donated to help our cause, and to our volunteer collectors, Blondie, Brenda and Susan, who helped us to raise £282.16. The annual ECTA boat cruise took place on Saturday 4th July. Over 85 people joined in the fun and for once the weather was fantastic. 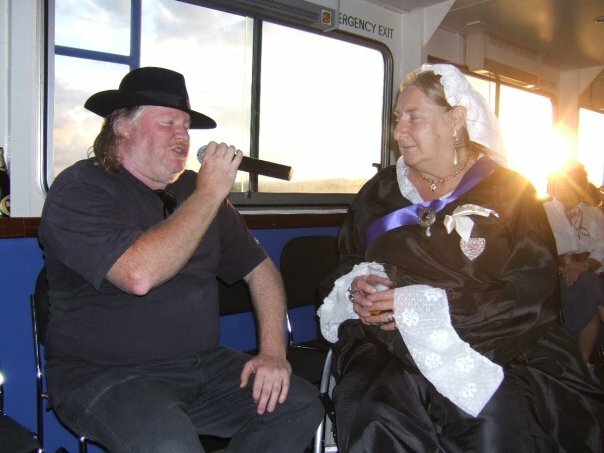 A great time was had by all, with people enjoying the live music, beautiful scenery, on-board barbeque and licensed bar. And crucially, over £400 was raised to help support our services. Thanks to everybody who attended and to everybody who put so much effort in to their fancy dress costumes! If you missed out this year, fear not! We'll be doing it all over again next year. Pencil Saturday 3rd July 2010 into your diaries! The new City Sights service launched at ECTA on May 1st. 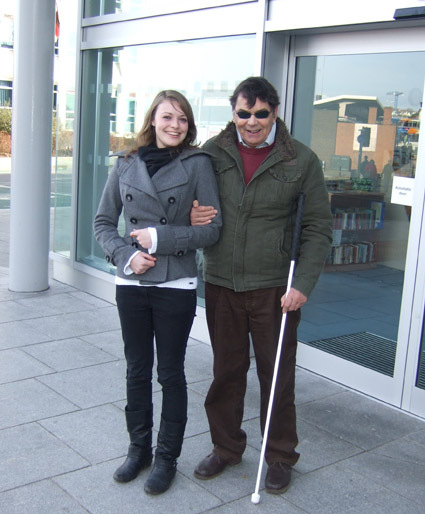 The service provides blind and partially sighted people with a sighted guide to help them access Exeter City Centre and it's shops services and facilities. You may have noticed that opposite the Exeter CTA offices in Paris Street is our very own new charity shop. The shop is selling clothes, bric-a-brac, CDs, DVDs and many other gems. Why not grab yourself a bargain- it's based at 19 Paris Street, Exeter. We are also looking for volunteers for the shop- please click through to our vacanies page for more information. If you have anything you would like to donate to us to sell in the shop please let us know! You can either drop it down to us in person or we can arrange collection locally if required. Give us a call on 01392 494001 to arrange. All donations are very gratefully received! Put your knowledge to the test at ECTA's pub quiz. The quiz kicks off at 7pm and prizes have kindly been donated by Tesco, Thorntons and WH Smith. There will be a free buffet for anybody taking part. All proceeds will be going to Exeter Community Transport to help us sustain our vital services to anybody with mobility issues. To celebrate our 15th birthday, we are holding an Open Day at our Shopmobility offices in Paris Street. If you would like to join us, the event is kicking off at 11:30am. Exeter Community Transport Association will be providing scooters and wheelchairs for visitor to the South West Disability Show on Friday 6th and Saturday 7th June at Westpoint Centre, Exeter. The South West Disability show is the largest event in the region to focus on independent living and mobility for people with all forms of physical, sensory and learning disabilities and mental health impairments. The show is aimed at both end-users, their families and carers as well as professionals who help facilitate their everyday lives. The extensive list of exhibiting companies not only from the region but also from right across the UK provides visitors with the ideal opportunity to see, touch, try out and compare the latest products, services and initiatives. You will also be able to test the latest home aids, get advice from the numerous professional bodies, charities and other represented organisations, test drive vehicles and view the latest leisure, clothing and accessories. The show organisers, atanyevent have made arrangements for scooters and wheelchairs to be provided free of charge to visitors. Alexandra Rose Day is here on the Streets of Exeter on Saturday 14th June 2008 when Exeter CTA will be carrying out their annual collection in conjunction with ARD. Alexandra Rose Day co-ordinates collections for charities across the UK, organising licenses and collecting materials and Exeter Community Transport Association will be organising a team of volunteers to collect on the day. We will be raising valuable funds to help to purchase new scooters to help people with limited mobility to enjoy an independent life and join in the activities that able bodied people may take for granted. 10% of the money raised on the day will be returned to Alexandra Rose Day, who then distribute the money via grants to charities across the country. We are very happy to be working with Alexandra Rose Day again as it gives us the opportunity to raise funds for ourselves as well as helping many other worthy causes at the same time. We, ourselves, have received a grant from the fund and are able to see the way it works. Our volunteers also enjoy the day, as it is a really visible form of fundraising and gives us the opportunity to get out and talk to our supporters about the work that we do. ECTA's new taxi service for people with mobility issues has officially launched. The ExeAccess launch took place of Friday 25th April with MP Ben Bradshaw cutting the ribbon to declare the service officially open. The taxi itself is wheelchair accessible with fares set 10% below Exeter's biggest private hire firm. Exeter Community Transport Association would like to say a big thank you to everyone who helped with their store Collection at Tesco Exe Vale and, of course, everyone who donated on Friday 4th and Saturday 5th April to help to raise £409.83 for the charity which supports disabled people and people with any kind of limited mobility to enjoy a full and independent life. The County Chairman of the Trefoil Guild, community of over 18s who are or have been involved in Guiding, Cynthia Saunders, will be visiting Exeter Community Transport Association's Shopmobility Centre in Pairs Street, Exeter on Tuesday 11th March as part of the Guild's Challenge to travel the Region. Exeter CTA will be providing use of Shopmobility scooters for members of the guild to easily access the city in their quest. Cynthia Saunders will be joining the guild's trek at the start of their journey at the centre at 2pm, from which the team will tour the city and the Cathedral area. Exeter Community Transport Association supports people with any kind of limited mobility, whether short or long term and offers support and assistance in reaching the facilities and taking parting the activities that able-bodied people may take for granted but which are too often denied to disabled people. Together with completing the Exeter section of the challenge, the guild will gain an insight into navigating the city from the point of view of someone who relies on use of a wheelchair or scooter to lead a full and independent life. For more information on the services that Exeter Community Transport Association provides to support independent mobility, please call the office on 01392 494001. Exeter CTA's Mobility Awareness Day in Guildhall Shopping Centre was a fun day for everyone involved and the Beacon Wheelchair Dancers brought the crowds in to watch their display. The Express and Echo kindly videoed the day for us, capturing the fun and frantic moments of our Shopmobility Challenge and the Obstacle Course. 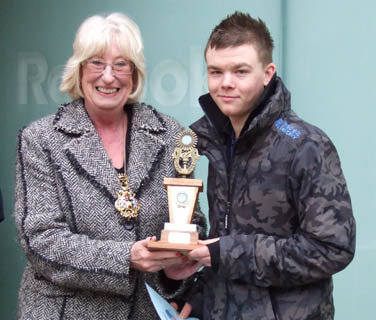 The Lord Mayor, Hazel Slack, attended to take part in the Wheelchair Dancing and also to present the Shopmobility Challenge Trophy to Darren, who took part in the Treasure Hunt on behalf of Sainsbury. And also to the Guildhall Shopping Centre for their support of the event. The event was also supported by Speedy Hire, who donated the use of the traffic cones for the obstacle course and Sainsbury also provided shopping items for participants to collect along the course. O'Brien's Coffee Shop in Guildhall also donated teas and coffees for our volunteers and display teams. Body Shop, Birthdays, The Works, Mothercare, Sainsbury, Hawkins Bazaar, Tony Pryce Sports, W H Smith, Game Station, Pete's Place, New Look, O'Briens. Shopmobility... not just about Shopping!!! Our awareness day will be held between 9.30am and 4pm, with an opportunity to try out our scooters and wheelchairs in a timed challenge, and watch our Treasure Hunt, where we pit local shopkeepers against each other to win the Shopmobility Challenge Cup! There will be a display by the Beacons Wheelchair Dancers from 10.30am until 11.30am, including a short workshop, when the public will be given an opportunity to have a go. From 11.30am The Exeter Otters Wheelchair Basketball Team will be demonstrating their skills with a display. We will then be holding our "terrifying" obstacle course: a fun slant on a serious message... we will be placing cones and obstacles for you to navigate... This is a timed challenge and points will be lost for every injured cone! Open Day at the Shopmobility Centre!!! Come along between 11am and 3pm and see our services in action - try out the scooters and wheelchairs to see how we can help you. Do you care for someone with a mobility impairment? Our services are there to help you. Come along and find out how! There will be free refreshments available for visitors and we will be holding a raffle with exciting prizes to be won - don't miss out! New Year's Resolution to start running again? Need something to help keep you focussed? Exeter Community Transport Association is encouraging you all to keep fighting fit through 2008 by asking for runners to take part in the 2008 Great West Run on Sunday 4th May. It is always difficult to keep those resolutions and what better way to maintain your determination than to run to raise funds for those with limited mobility. The run is organised by Ironbridge Runners and training runs are offered to help keep you going and support your training. Fundraising and Publicity Officer, Deborah Rylands says "Running and raising sponsorship for Exeter Community Transport Association will not only help to keep you focussed but will also help other people to get around by helping to fund equipment for Shopmobility, Ring&Ride, Leisuremobility and our new ExeAccess project, which is due to launch in March 2008. Your mobility can help to develop services for those without independent mobility." As well as appealing for runners to take part in the race Exeter Community Transport Association are looking for two teams of four people to help volunteers from their regular Shopmobility customers to get round the route in their wheelchairs. Deborah says, "Our regular Shopmobility users are also keen to raise money for us and two users have volunteered to take part in the Great West Run. However, as they are wheelchair users they each require teams to push them. The teams need to have no less that four people to take turns pushing and they need to be fit and strong." Exeter CTA are delighted to announce that Age Concern have decided to support ECTA's services with funding for our Shopmobility Shuttle service. Shopmobility Shuttle will operate individual trips to help local people with limited mobility to get into the city to link up with mobility services that will help them to enjoy the freedom of the city. Age concern's funding will be used towards paying for a member of staff to operate the service to help people to get into our heritage rich city and enjoy a full life, accessing the facilities and services that an able-bodied person may take for granted but which are all too often denied to those with limited mobility. Exeter Community Transport Association is the grateful recipient of £1,000 from the Christmas Spectacular by the Stan Hacking Concert Band, which was held at the weekend. ECTA's Manager, Kay Yendall, was delighted to be invited to join the festivities and collect a cheque from Stan's Band and enjoy the evening, which was a enchanting set of holiday music, songs from the musicals and sing-a-long carols from the 80-strong band. The ever popular concert was a sell out and everyone enjoyed a magical, Christmas, evening out. The band has a strong following and a wonderful community spirit to the shows. Kay says "We really enjoyed the show and the seasonal atmosphere of the evening. Not only did Stan and his band take us on a wonderful journey around the world of music, through this donation they are also helping us to help people to escape their homes and take their own journeys around our wonderful city". Exeter CTA were chosen by The People as the beneficiaries of ITV and The Big Lottery's The People's Millions, a programme designed to help the public to choose how their community benefits from Lottery funding..
Exeter CTA are fundraising to run ExeAccess: a specialist transport scheme to bridge the gap in the commercial service and offer a lifeline to people in Exeter who are living with limited mobility. The funding would enable the local charity to purchase a specially adapted vehicle for easy wheelchair / scooter access in order to offer a taxi service aimed at people who need additional help getting into and out of vehicles. Fundraising and Publicity Officer, Deborah Rylands, says "We are awe struck at the support that we have had from everyone in helping to make this happen. Thousands of people voted to choose our project to win this fund and we are delighted that we now have the opportunity to reach these people to help them to take part in the activities that matter to them. We would like to say a huge thank you to everyone for voting for ExeAccess"
Exeter's Lord Mayor today visited ECTA's shopmobility centre in Paris Street to support the appeal for people to vote for the local charity's ExeAccess project in Thursday's The People's Millions. Exeter CTA are fundraising to run a specialist transport scheme to bridge the gap in the commercial service and offer a lifeline to people in Exeter who are living with limited mobility. The funding would enable the local charity to purchase a specially adapted vehicle for easy wheelchair / scooter access in order to offer a taxi service aimed at people who need additional help getting into and out of vehicles. Fundraising and Publicity Officer, Deborah Rylands, says "The service will enable local people with limited mobility to enjoy the freedom of access that able bodied people may take for granted. Transport without prescribed routes and times offers freedom of choice and it is just not available at the present time." "At the moment, anyone who needs extra help or is in a wheelchair simply cannot get the help that they need, when they need it. We are keen to operate the service which complements the work that we do to support independent mobility. The People's Millions are decided by the public vote and we need everyone to watch our piece on ITV Westcountry news on Thursday 29th November and vote for us to help provide independent mobility for all. Calls cost 10p and up to 10 votes may be made from any one phone line. We are asking everyone to vote for the right to choose and the right to an independent life." Don't forget to vote on Thursday 29th!! You can help us to win £80,000 to support independent mobility in Exeter. ECTA has been selected as one of the final eight projects to be entered into The People's Millions competition to win £80,000 to run an accessible vehicle. We know that people who need help to use transport have difficulty in getting the help that they need. We are appealing for funding for our ExeAccess project, to provide an accessible vehicle for people who need help with transport so that everyone can take part in their community. People who cannot use normal vehicles will be able to lead fuller lives and join in with their communities by reaching services, attending social activities, church services and group meetings and making and meeting friends. The competition will be aired during week commencing Monday 26th November on ITV Westcountry News with our appeal showing on Thursday 29th November with a dedicated phoneline to vote for our project. Please get everyone you know to vote for independent mobility! The phone number will be available on the morning of 29th November and will be published in the Daily Mirror and on the ITV Westcountry News as part of our appeal film. The voting numbers will only be valid on that day. Votes can be cast by phone or text from 9am until midnight. Calls cost 10p and you can make up to 10 calls from any one phoneline. Remember, a vote for ExeAccess is independent mobility for you! Thank you to everyone who came along to the filming of our appeal on Friday 2nd - look out for yourself in the appeal film. Please keep your eyes peeled, as we need you to vote for us so that we receive the money that we need!